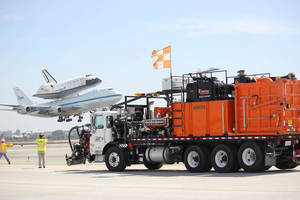 WIXOM, MICH. - When the space shuttle Endeavour made its final landing Sept. 21 at Los Angeles International Airport (LAX), it arrived on a runway maintained by a StarJet(TM) pavement marking removal system from NLB Corp. The StarJet, operated by Sterndahl Enterprises, Inc. of Sun Valley, Calif. removes old runway markings and rubber build-up with high-pressure water jets (up to 40,000 psi) without the pavement damage that often results from abrasives or grinding. The self-contained system has rotating water jet nozzles on a front-mounted articulating arm with a pump unit, water tank, and vacuum system to recover the water and debris. NLB Corp., www.nlbcorp.com, is a global leader in high-pressure and ultra-high pressure water jet systems. NLB manufactures a full line of quality water jetting pump units and accessories for contractor and industrial uses, including pavement stripe removal, runway rubber removal, pipe and tube cleaning, surface preparation, product removal, tank and tube bundle cleaning, concrete hydrodemolition, concrete and pipe cutting, and more. Fluid Exchange Systems keep vehicle fluids uncontaminated. Brush Cleaner removes residual materials from conveyor belts. Rental Cleaning System cleans HVAC coils up to 16 in. thick. Floor Chemical Application Machine operates at high speed. Floor Repair Material does not spread to surrounding areas.